The Council undertakes an annual residents survey to seek feedback on what residents think of Council services such as water supply, roads, and rubbish and recycling collection. The survey seeks about 1 000 responses from randomly chosen residents and uses a quota system to ensure participants were representative of the age, gender and population of the Ellesmere, Malvern, Springs and Selwyn Central wards. To help Council’s future planning residents surveys also seek information on topical issues. For example, in this year’s survey, residents were asked about the Council’s Smokefree Policy and what they think of pokie machine gambling. The Council hired the research company Research First to conduct the 2014 survey. A summary of the results of the 2014 Survey [PDF, 3374 KB] is provided below. Residents were also asked to rate a broad range of services on a priority scale. 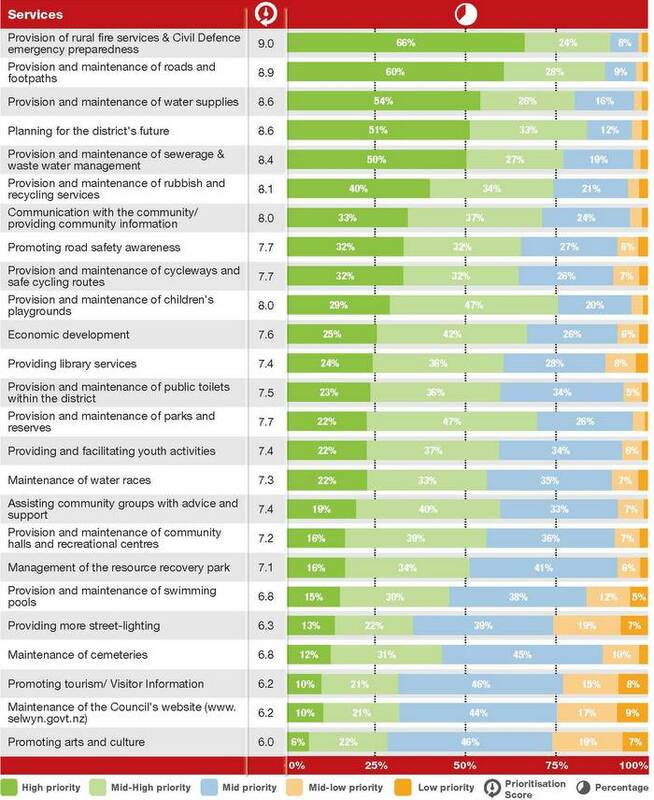 Services most highly rated were rural fire and civil defence, roads and footpaths, and water supplies.